We spell our POMELOS, P-O-M-E-L-O...but even if you like to spell (or call) them Pomelos, Pommelos, Pummelos, Pompelmous, Shaddock, You Zi or even an Asian Grapefruit, you would still be correct! Which ever name you prefer,Pearson Ranch grows pomelos and ships them right to your door. Pomelos have a refreshingly sweet and mildly tart flavor. Their rosy pink interior, extraordinary texture and their incredible fragrance make them a delicious eating citrus fruit. Pomelos are a perfect addition to breakfast, salads, or use pomelos to create an exotic entree or desert. And now that you know where to buy pomelos, here is a little more information about them. Did you know? The U.S. is the largest producing country of Pomelos? 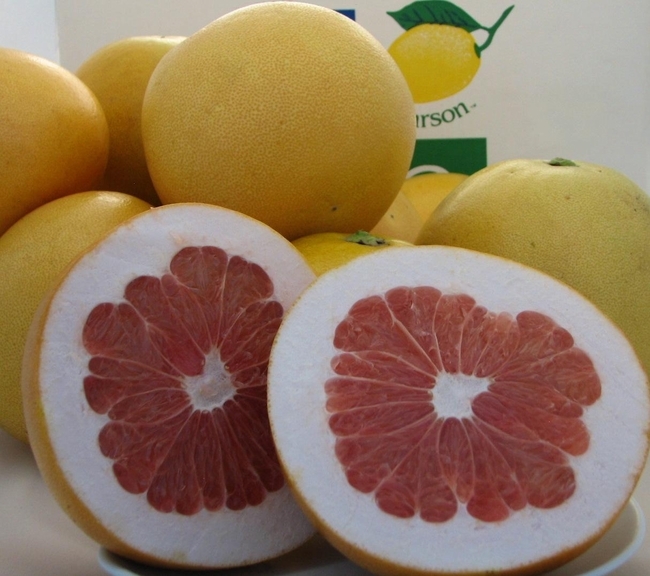 That's right, The U.S. now grows more Pomelos than even China! Why Buy Pomelos from Pearson Ranch? Our mature pomelo trees are closely tended to by hand in order to ensure their unique flavor and fragrance. Proper amounts of well water and the right balance of fertilizer with California's famous warm sunshine, help grow the absolute best pomelos...anywhere!